I went with the basic “Mickey” head silhouette and the colors red, black & yellow. 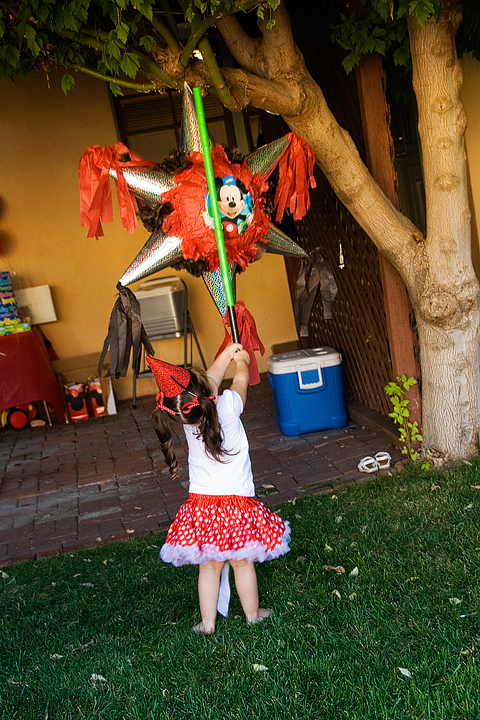 I wanted the party as DIY as possible, and with the exception of the pinata, the treat bag goodies and loot bags for pinata candy, I was successful in my quest. 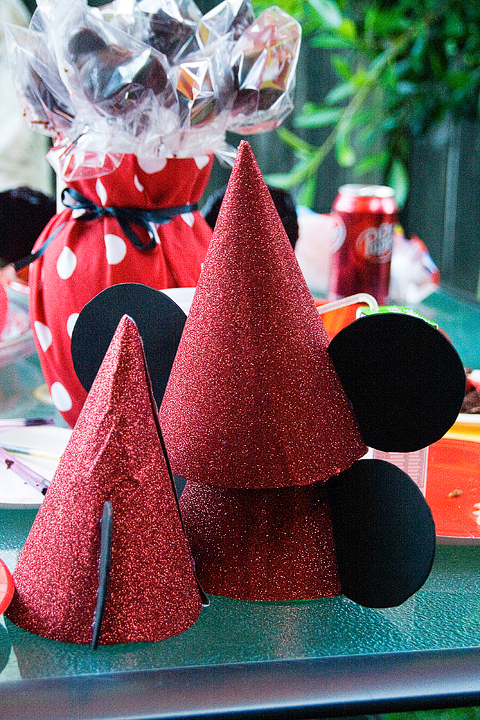 I made these Mickey Mouse hats. Thanks to Pinterest, I found this handy tutorial on how to make them. I had lots of leftover hats from birthdays past, so I only had to buy glitter sparkle wrapping paper (instead of scrapbook paper–it was much cheaper!) and black craft foam. I found that hot glue worked best for this project. So for some reason, I forgot to photograph these at the party, so this crappy cellphone picture will have to do. These are the treat bags. 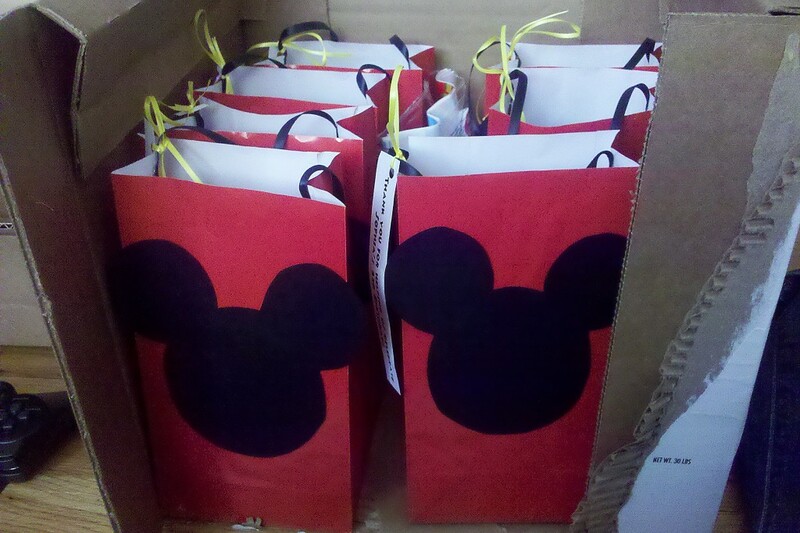 I bought red treat bags and hot glued black ribbon handles. I printed out little thank you messages (Thanks for celebrating Sophia’s 3rd Birthday with us!) and tied that to the black handle with yellow ribbon. I then hot glued a black Mickey head silhouette to the front of the bag. I just Googled Mickey Mouse Head to get a size I wanted. (I was not unpleasantly surprised by that Google search, BTW but I only needed the first page…so your results could vary if you clicked through all results). 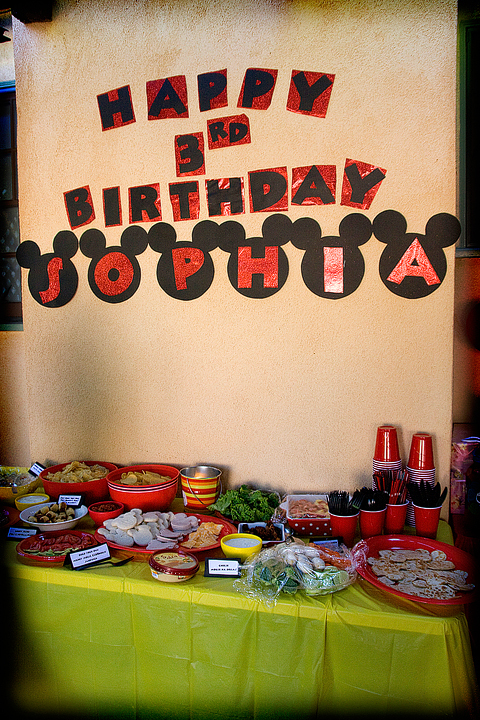 The birthday banner & food table. I downloaded THIS Minnie font and used it to print letter templates and then traced the letters on black paper & the leftover glitter wrapping paper I used for the birthday hats. Bill drew a larger silhouette Mickey head & I cut them to fit the larger letters. I had a bunch of smaller pieces of the glitter paper so I just used those to stick behind the black letters. It was a little piecemeal, but I think it worked okay. We also had red and yellow streamers, red, black and yellow balloons and I made silhouette banners to string up around the patio, but I didn’t get the chance to photograph those properly. 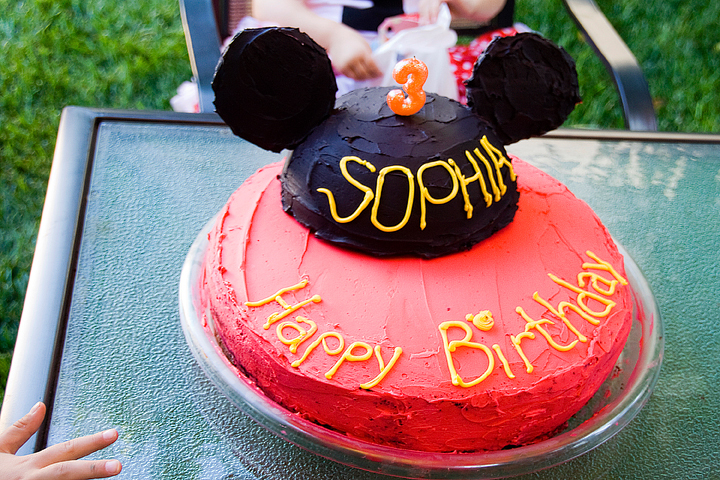 I took my inspiration for the cake from this one I found by searching for Mickey Mouse cakes. The head is cake baked in a glass bowl and the ears are chocolate that I melted & cut into a circle, putting a lollipop stick in it while still warm (a chocolate lollipop). I then stuck the sticks in the head & covered it all in black dyed buttercream. We decided to go with print on the hat, so Sophia could recognize her name. Bill did all the lettering work. The thing I learned about this cake? I will never again make one this diameter unless I get better baking tools, because flipping and cutting the layers were a pain. If you were able to x-ray the cake, you would have seen a big ole hot mess on the inside, kept together by buttercream and whipped cream. 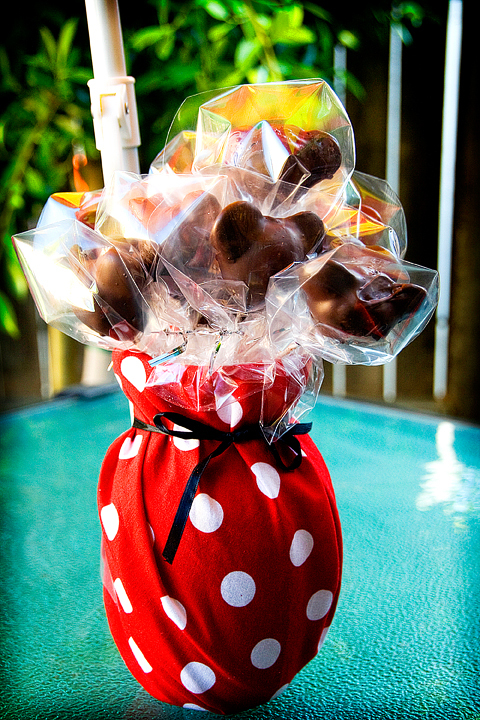 I got this brilliant idea to make Bakerella’s Mickey cake pops with the leftover cake and shavings. This was a bit harder than I imagined, but I got them done. They were too heavy for the stick, and some fell off as soon as you took a bite, so next time I will have to make the heads smaller. I bought the cute fabric for Sophia’s birthday t-shirt, but it ended up clashing with her skirt (Next time? Buy the fabric AFTER the skirt arrives in the mail). I repurposed the fabric & covered a few glass vases I had and used them as cake pop centerpieces. Inside the vases are pieces of flower foam that they sell at Michael’s to help keep the pops up. Sophia’s birthday outfit. I bought the skirt from Etsy Seller GemmasRoseBows. I really adored it & think it turned out well. I went all DIY with the shirt. 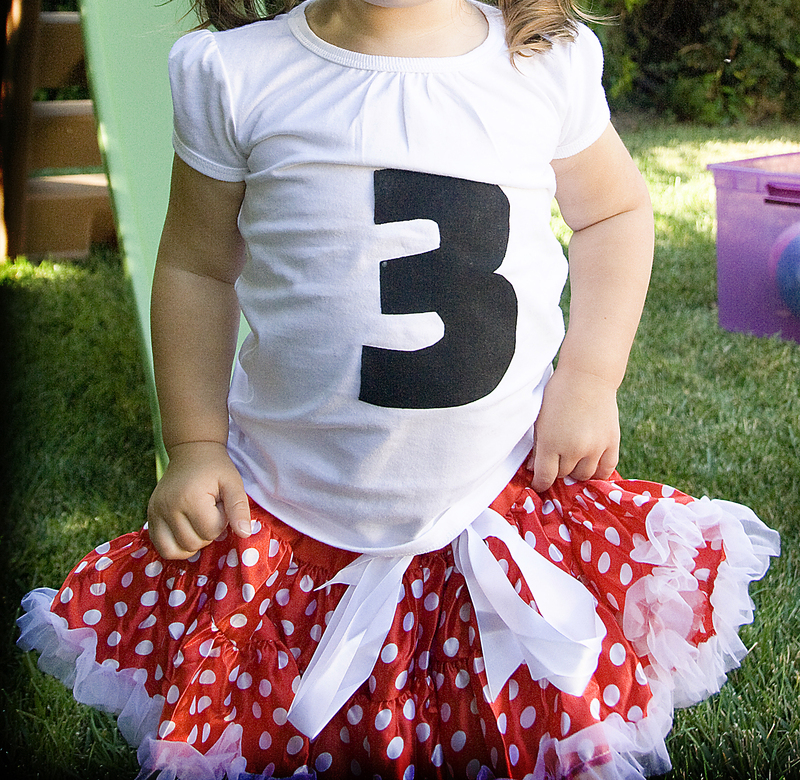 Basic white t-shirt, iron on transfer sheets & a black fabric “3” cut out using the same Minnie font template as the rest of the birthday font. Cut it out, ironed it on, and presto! A birthday shirt for people who don’t have a sewing machine (like me!). Sophia and one of the few commercialized Mickey items at the party. Full view of the adorable skirt and her little barefoot self (apparently our party was “shoes optional” as both girls lost theirs earlier in the party). 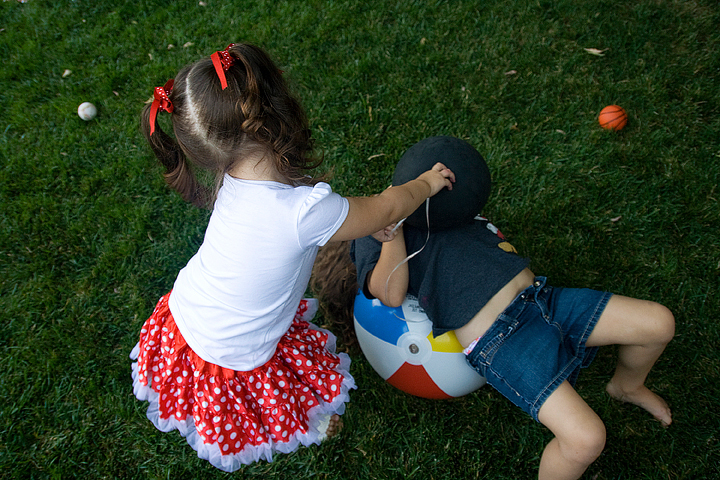 When sisters attack. The 5 pounds of cake starting to kick in and the silliness ensued. 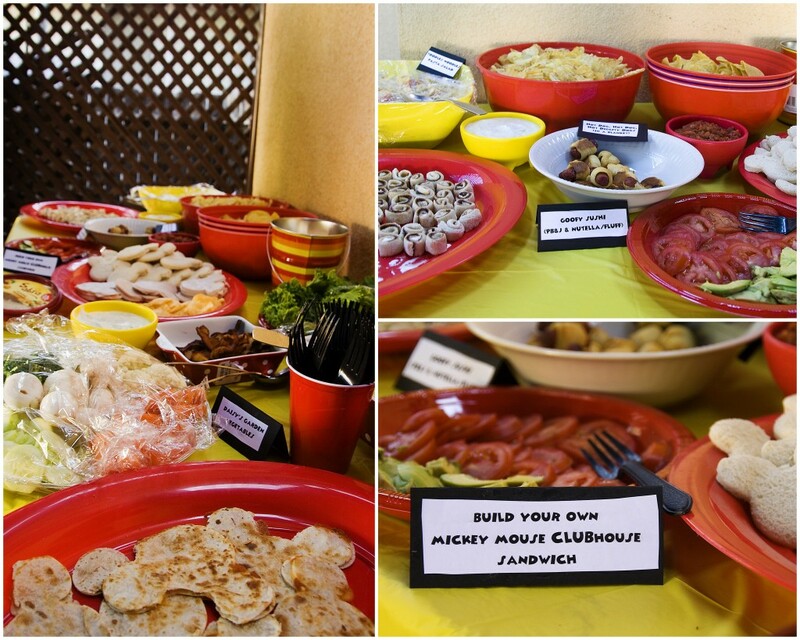 There you have it, our take on a Mickey Mouse themed birthday party. Sophia declared it an “Awesome Blossom” birthday and that it was the funnest (totally a word to a 3 year old) day ever. She is still talking about her “MickeyMouseBirthdayParty” (yes, she says it really fast and all together just like that). Thank you to everyone who gave me ideas, sent me links and talked me down from the ledge when I freaked out about not having everything together. Thank you also to everyone who came to help us celebrate, or who were unable to be with us, but wished our Sophia a happy day. The party made her smile all day long, so it was a success! Everything looks great! And the cake pops were delicious! You did such a great job, Natalie! Everything turned out amazing and I cannot believe you made that cake! Sophia looks so adorable in that birthday outfit! This party is so cute and you did a fantastic job! 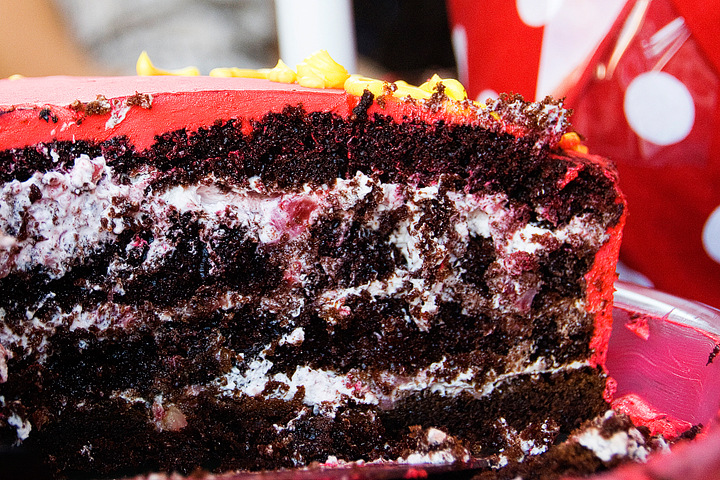 That cake is amazing! The cake pops were sooo good. Did you actually roll it by hand or use the cake pop mold? Looks fantastic, well done, plus you have given some great ideas and tips that I will use! Love ur diy ideas so excited to borrow some! Thanks for sharing! Where did you get the fabric for the vase ?